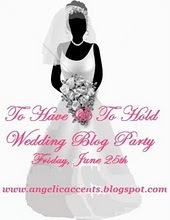 Welcome to the party today, hosted by my dear friend Stephanie of Angelic Accents. It will be a wonderful day filled with lots of wedding memories and inspiration. Be sure and click on Steph's blog name to visit the many participants today. My party today will be filled with a focus on vintage pics from the past and a few from my own wedding. I have made a wedding cake and strawberry punch, just for the occasion. To start the party, I have a few old vintage pics I came across while going through my past photos. I love black and white photos and the elegance of the details. All these brides are 2nd cousins of mine and all since passed away, but the memories of there special days of weddings in the early 40's, live on in these pretty photos. Aren't they gorgeous, and couples at the time made lapel buttons to wear after their special day. How fun was that!! And while I was browsing through the photo albums,preparing for this party, I again went through my own book. Such a wonderful day with special memories, I so hold dear. My own anniversary is just around the corner and my beloved and I will be celebrating 37 beautiful years together. Here is a bit from our special day. Mother helping me with my head piece and one final look in the mirror. My Mother always wore a smile and always had a kind word for everyone. She was in my eyes an angel on earth! My Father and I sharing a special moment. He was and is, along with my husband, my hero! Look at my mother's pretty pink crystal necklace and earrings set she wore with her pink dress that day. This is the simple pearl necklace and earrings I wore and still wear today. Mother and Dad look on as I dream about the wedding and ready to go to the church. Notice the pic on the wall of my soon to be husband. My parents loved him like their own son. As we walked out on the porch for more pics, the hot and muggy August day began to rain. Oh I was getting nervous that it would rain all day long. Mother told me it was good luck to rain on your wedding day. I turned to hold a sweet bloom of a hanging porch flower, say a prayer for blue skies and suddenly the rains stopped and the sun shown brightly. All was right with the world!! Tiers of lace flow from top to train of my wedding dress. The cake had little white doves nestled around the flowers. I was able to save one and keep it safe in this sweet memory china box given by my mother. Sneeking a kiss in the dark! The Happy Couple August 11th 1973, 37 years ago! Renewing our vows for our 30th wedding anniversary. It was a glorious day in a little chapel in California where we spent our 30th anniversary vacation. Sweet little white chapel. My beloved planned this whole trip. I did not know where we were going till we got on the plane. All he did was tell me, about a month earlier, was to pack a dress I could get married in. It was a romantic surprise I will never forget. Best Guy and I with the minister he chose to renew our vows. He was a beautiful and kind soul. My sweetheart also picked music that was played on our wedding day. Wonderful memories! Hard to believe that was 7 years ago already and 37 years in all. Now aren't you ready for some cake and punch! I have made one of my faux wedding cakes special for this blog party and we will enjoy a refreshing cup of strawberry lemon punch. I created the cake from beautiful white brocade fabric, lace trims with a trail of pink rosebuds with gemstones and topped with the wedding couple figurine our son gave us for our 25th wedding anniversary. I cherish this piece and it makes a special cake topper too. Enjoy some punch. This recipe is simply pink lemonade and 7up topped with fresh strawberries. It has been so wonderful to have you visit my wedding party hosted by our gracious hostess Stephanie. This was her first party to host and she has done an amazing job. Thank you Stephanie for your time and effort to host this fun event. I look forward to visiting the other special parties listed today. In honor of Summer weddings this year, I have hand painted a vintage tray. It is available in my little pink boutique on Make Mine Pink,Celestina Marie Designs. Now as a parting gift, I have for you, one of my sweet pink faux cakes topped with a silver glitter bird and tulle. Till next time, Blessings and Blue Skies be Yours.